I just saw a ridiculous UFO program on The Military Channel, and I am irked. First the narrator referred to the Roswell event as "a UFO sighting." Then he said that the event began when a flying saucer crashed on a ranch near Roswell. What's wrong with that, you may ask? Both statements were presented as fact, but neither statement is true. The events at Roswell did not involve a UFO sighting at all, and therefore there was no UFO to crash. This is UFO 101, folks. We're probably all pretty well acquainted with the story, so I won't bore you with a recap, but the events started when a ranch foreman found some strange material on the ground, and that's it. He didn't see any unidentifiable objects in the sky. He didn't see anything crash. He found some stuff. On the ground. 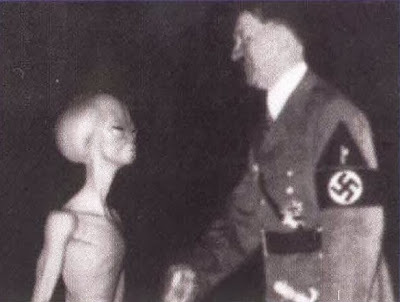 Did Hitler plot with E.T. to take over the world? I believe he may have. This is one big reason UFOlogy has such a bad name. How can anyone take us seriously if theory and speculation are routinely presented as established fact? I'm not saying I don't think anything strange happened in Roswell in the summer of 1947, but I am saying that no one has ever proven anything. People need to accept that. In the opening chapter of my book about UFO researcher Dr. J. Allen Hynek, I give the Roswell event a couple of brief paragraphs. 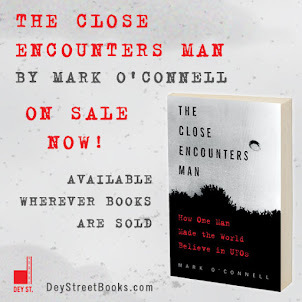 My editorial consultant Mxxx, the Scientific Director of the J. Allen Hynek Center for UFO Studies (CUFOS), has suggested that I not mention it at all, however. The Roswell event barely registered when it occurred in 1947, he reasons, and it was never a factor in Hynek's career. In fact, Hynek was generally pretty dismissive of stories about crashed flying saucers and recovered aliens. 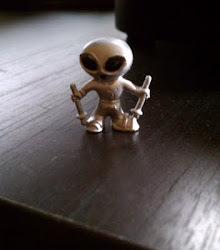 I only added the description of Roswell in the chapter to establish context, as a way to show how the flying saucer phenomenon worked its way into the public consciousness in 1947, but I am inclined to agree with Mxxx that it doesn't deserve even the small amount of real estate I've given it. So, out it goes. And I won't miss it. I just need to stop watching dumb UFO "documentaries" on cable. Since you give his position, I think it's safe to say "Mark." We all know who you mean. On another point, it's interesting that in recent posts, you, Kevin Randle and Michael Heiser have all made the same basic complaint about crappy UFO "documentary" TV programmes (three different docs, by the way). Did Allan Hendry give you an interview for your book? Wow, a lot of good comments! #2: I have not made any progress on the Allan Hendry front, but I have not given up! I would love to get him into the book somehow.